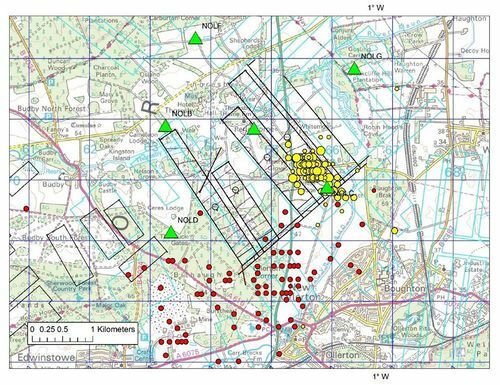 The primary aim of the seismicity work package is to deploy a network of seismic sensors to monitor background seismic activity in the vicinity of proposed shale-gas exploration and production near Kirby Misperton, North Yorkshire and the Fylde, Lancashire. The data collected from these sensors will then allow characterisation of baseline levels of natural seismic activity in the region, and subsequently facilitate discrimination between any natural seismicity and induced seismicity related to shale-gas exploration and production. A further aim is to use the results of the monitoring to make recommendations for a suitable traffic-light system to mitigate earthquake risk. The initial design requirement for the seismic monitoring network was reliable detection and location of earthquakes with magnitudes of 0.5 and above within a 20 km by 20 km area around the two proposed exploration sites at Preston New Road, Lancashire and KM8, Vale of Pickering. The seismic monitoring network around KM8 consists of seven near-surface sensors (red squares in Figure 20) and four sensors installed in boreholes (orange squares in Figure 20). The latter comprise three downhole geophones and a downhole broadband seismometer. Figure 20 Ordnance Survey map of the Vale of Pickering. Red squares show the surface sensors and the orange squares show the locations of the borehole sensors. There are also surface sensors co-located with some of the borehole sensors. The yellow star shows the location of the drill site. © Crown Copyright and/or database right, 2018. Licence number 100021290 EUL. Figure 21 Ordnance Survey map of the Fylde peninsula. Red squares show BGS sensors and the blue squares show the locations of Liverpool University sensors. The star shows the location of the site of possible hydraulic fracturing at Preston New Road. © Crown Copyright and/or database right, 2018. Licence number 100021290 EUL. The borehole sensors are situated at a depth of approximately 30 m below the surface and are all close to KM8. Installing instruments in boreholes is intended to improve the signal-to-noise ratio of the recorded data and allow smaller events to be detected and located. 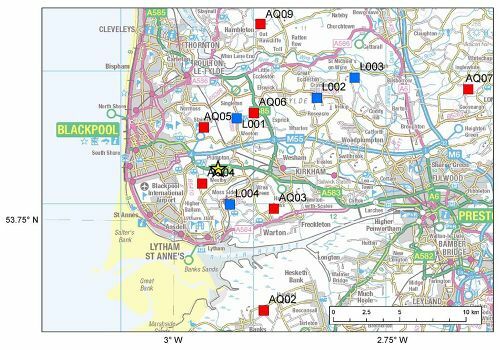 The seismic monitoring network across the Fylde consists of eight near-surface sensors (red squares in Figure 21). Stations AQ05 and AQ06 were installed in March 2018 and September 2017, respectively. We also receive real-time data from four stations (blue squares in Figure 21) installed and operated by Liverpool University. The latter were installed independently of this project and data acquisition from these is therefore not guaranteed. Continuous data from all stations are transmitted in near real-time to the BGS office in Edinburgh, where the data are processed and archived[note 1]. The completeness of these data can be easily checked to gain an accurate picture of network performance. The completeness levels for the seismometers in the two areas are shown in Figure 22. All stations in the Vale of Pickering show high levels of data completeness for the time period 1st April 2017 to 31st March 2018, with over 95% available from all stations except AU13, AU14 and AU16, which were 94%, 94% and 93% complete, respectively. This means that the detection capability of the network was good over this time period and loss of data was minimal. The level of data completeness is similar to the values obtained between 1st April 2016 and 31st March 2017 as reported in the Phase 2 report (Ward et al, 2017). Figure 22 Data completeness for the period 1/4/2017 to 31 /3/2018 for monitoring stations in the Vale of Pickering (AU07-AU20) and Fylde (AQ02-AQ10). AQ05 is not included as it was not installed until the end of the reporting period. AQ06 was installed in September 2017. A value of over 95% is extremely good for data transmitted in near real-time using mobile phone networks and is better than many of the BGS permanent monitoring stations that use similar technology. Data losses that have occurred result from failure of outstation hardware, data communication problems, or failure of central data processing. The data acquisition is able to recover from short breaks in communications links to outstations by re-requesting missing packets of data from local data buffers, but failure of outstation hardware requires intervention by local operators or maintenance visits. We use power spectral density (PSD), calculated from one-hour segments of continuous data, to characterise noise levels at a range of frequencies or periods at each of the installed stations. A statistical analysis of the PSDs yields probability density functions (PDFs) of the noise power for each of the frequency bands at each station and component. Figure 23 compares the median noise levels calculated at three stations in the Vale of Pickering network (AU08, AU13 and AU14) in three different time periods, 1/4/2016 to 31/3/2017 (solid lines), 1/4/2017 to 31/06/2017 (dashed lines) and 1/7/2017 to 30/09/2017 (dotted lines). Although there are clear differences in noise levels at different stations, the noise levels at each station do not change significantly in different time periods, demonstrating that there is no significant degradation in station performance. This is also the case for the other stations in the network. Comparing the median noise levels at the selected stations in the Vale of Pickering and the Fylde networks, Figure 24 shows that the Fylde stations are noisier than those in the Vale of Pickering and most other stations in the BGS permanent network. This is because the Fylde is more densely populated, with many sources of cultural noise. Figure 23 Median noise levels at all stations in the Vale of Pickering network as a function of frequency. AU10, AU13.00, AU14.00 and AU16 are borehole sensors. All other sensors are at the surface. Figure 24 Comparison of the median noise levels at the selected stations in the (a) Vale of Pickering and (b) Fylde networks. We use the median, 5th and 95th percentiles of the observed noise at each station to test the variation in the detection capability of the Vale of Pickering network in different noise conditions. First, we calculate the RMS amplitudes of ground displacement in a constant relative bandwidth of one decade for each station. The resulting RMS amplitudes for each station and for each percentile are shown in Figure 25. 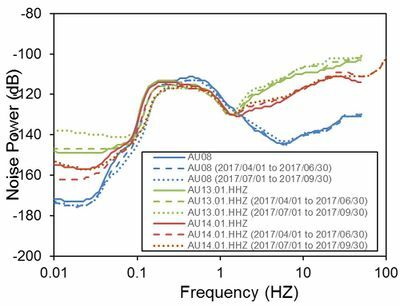 As before, we find that noise can vary significantly even for stations that are close together, with variations in RMS displacement amplitudes exceeding two orders of magnitude even in quiet conditions. We also find significant variation between low (5th percentile) and high (95th percentile) noise conditions, which suggests that detection capability will vary strongly with time. Divide the region into a regular grid of points. For each grid point calculate the distances between the grid point and each station. For each station calculate ground displacement amplitudes for different magnitudes. Find the smallest magnitude value for which the signal amplitude exceeds the noise amplitude by a factor of three at five or more stations. Figure 25 Observed RMS noise levels determined from power spectral density estimates for each day over the time period 01/04/2016 to 31/03/2017. Figure 26 shows the variation in the magnitude of earthquakes that would be detected by the network in different noise conditions. In the quietest conditions (Figure 26b), the network is capable of detecting events with magnitudes as low as -0.5 ML, however, this is only the case 5% of the time. The lowest detectable magnitude increases to just under 0.0 ML in median noise conditions (Figure 26c). For the high noise model (Figure 26d), the network is still able to detect event with a magnitude of 0.5 ML close to the centre of the network. 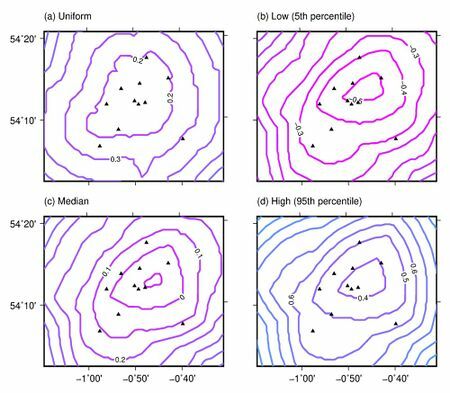 Figure 26 Modelled detection capability using observed noise levels for each station in (a) uniform, (b) low, (c) median and (d) high noise conditions. A signal in excess of three times the noise level is required at five or more stations for an earthquake to be detected. Continuous data from all installed stations are transmitted in real-time to the BGS office in Edinburgh and have been incorporated in the data acquisition and processing work-flows used for the permanent BGS UK network of real-time seismic stations. A simple detection algorithm is applied to the data from the Vale of Pickering and the Fylde, including data from permanent BGS monitoring stations, to detect possible events. An experienced analyst has reviewed all detections. Earthquake activity from the BGS earthquake catalogue in 100 km squares centred on the Kirby Misperton and Preston New Road sites is shown in Figure 27. Yellow circles show earthquakes in the time period from 1st April 2017 to 31st March 2018. Apart from a magnitude 0.7 ML earthquake close to Kirby Misperton on 22nd September 2015 at the very start of the monitoring project, no other earthquakes have been detected in the immediate locality of the Vale of Pickering, however, a number of other natural earthquakes from the surrounding region, along with quarry blasts have been detected. The closest earthquake to the network was a magnitude 0.7 ML event near Wold Newton, North Yorkshire, on 3rd November 2017, 27 km east of Kirby Misperton. A magnitude 1.9 ML earthquake was detected near Saxton, North Yorkshire, on 16th May 2017. Three earthquakes with magnitudes of 1.3 and 0.7 ML were detected near Hinderwell, North Yorkshire, on 20th March 2017, 35 km north. A number of earthquakes were detected in the Fylde peninsula in the period from 1st March 2017 to 31st March 2018. The closest of these to Preston New Road was a 1.7ML earthquake in the Irish Sea on 10th August 2017, approximately 30 km northwest of the Preston New Road site. All the other detected earthquakes were at greater distances either to the north or south. Figure 27 Earthquake activity in 100 km squares centred on Kirby Misperton (a) and Preston New Road (b). Earthquakes in the time period from 1/4/2017 to 31/3/2018 are marked by yellow circles. Circles are scaled by magnitude. © Crown Copyright and/or database right, 2018. Licence number 100021290 EUL. Figure 28 Seismic events in the Vale of Pickering region. Yellow stars show events detected between 1/4/2017 and 31/3/2018. Nearly all detected events are of a suspected explosive origin, i.e. quarry blasts. © Crown Copyright and/or database right, 2018. Licence number 100021290 EUL. A number of other events were detected in the Vale of Pickering. These are shown in Figure 28. The proximity of the calculated locations to quarries where blasting is known to take place, along with the recorded waveforms that are characteristic of a shallow source, suggests that all these events are of an explosive origin, i.e. quarry blasts. 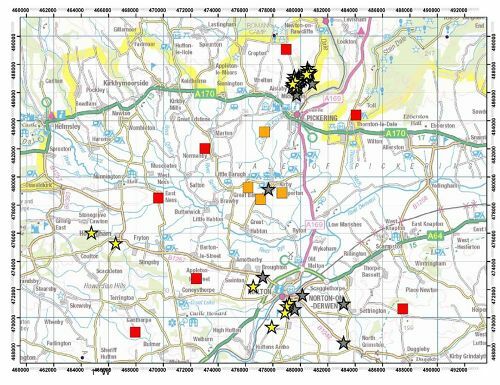 Twenty-one events in the time period from 1st April 2017 to 31st March 2018 were located just north of Pickering in close proximity to the Newbridge quarry, where a number of other quarry blasts have been detected in the past two years. The magnitudes of these events range from 0.7 ML to 1.6 ML. Four other blasts were detected close to a quarry south of Malton and two others were located west of Malton, near Hovingham. All of the suspected blasts occurred during the working week and during the day. Figure 29 shows histograms of the hour, (a), and the day, (b), of occurrence for all seismic events detected in the Vale of Pickering since the start of the project in 2015. Forty-one of the forty-eight detected events occurred between 10am and 2pm, with only two events occurring during the night: the magnitude 0.7 ML earthquake close to Kirby Misperton on 22nd September 2015; and the magnitude 0.7 ML event near Wold Newton, North Yorkshire, on 3rd November 2017. Similarly, all of the detected events occurred during the working week, with most of the events occurring on Tuesday, Wednesday and Thursday. The strong clustering of the events around the middle of the day provides further evidence of the man-made origin of these events, since we might expect natural seismicity to be more evenly distributed throughout the day. Figure 29 Histograms showing the hour, (a), and the day, (b), of occurrence for all seismic events detected in the Vale of Pickering since the start of the project in 2015. Helicorder plots showing 24 hours of data from each station are available online and can be found on the BGS Earthquake Seismology Team website and at http://www.earthquakes.bgs.ac.uk/research/BaselineMonitoring.html. The web pages also contain background information on the baseline monitoring project as well as educational material to explain the scientific context. Recordings of ground motions from all stations are stored in a public open-data archive. These data are available in the standard data format developed in the international seismological community for data exchange. In the future, processed event data (automatically determined and manually revised event parameters) will also be made available through this website. Very dense networks of seismic stations, such as that in the Vale of Pickering, that are designed to monitor very small earthquakes present a novel set of challenges in earthquake detection. For example: stations are often very close together, so noise may be coherent on several stations at once; separate phases may be very close together; and the requirement to detect very small earthquakes means that the signal-to-noise ratio may be poor. In addition, earthquakes may occur in rapid succession during hydraulic fracturing, and these need to be located quickly and reliably to make effective operational decisions. There are many algorithms available to scan a seismic data time series and detect perturbations that could be an earthquake. These are often referred to as ‘triggering’ algorithms. Here, we describe work carried out to test a number these algorithms and assess their suitability for near real-time detection and location using a dense network. STA/LTA (Trnkoczy, 2012). The average absolute amplitude of the signal is continuously calculated over two time windows, one long and one short. The characteristic function is simply the short-term average or STA divided by the long-term average, the LTA. Carltrig STA/LTA (Johnson et al., 1995). In addition to the two normal averages (STA and LTA), corresponding rectified averages (STAR and LTAR) are calculated. The rectified averages are the absolute value of the difference between the trace and the LTA, averaged over the corresponding windows. BGS uses this algorithm routinely for event detection. Recursive STA/LTA (Withers et al., 1998). This is a computationally more efficient version of the STA/LTA trigger that also recovers more quickly from large amplitude transients. It has smaller ‘shadow zones’ where, after a large transient passes the STA, the transient continues to dominate the output by causing a large LTA. Z-Detect (Withers et al., 1998). The Z-detector estimates the distance of the data from the mean in units of the standard deviation. It has the advantage of automatic adjustment to variance in the background noise. Akaike Information Criterion (Kitagawa and Akaike, 1978). AIC pickers have been used in many P-wave picking algorithms using autoregression (AR) (Leonard and Kennett, 1999). The data are divided into segments, each modelled as an AR process. For the intervals before and after an arrival, the AR coefficients will be of different order (Sleeman and van Eck, 1999). Finding the global minimum of the AR-AIC function gives the most likely position for a pick in the whole seismogram. FBPicker. The FBPicker is a modified transient energy method from Lomax et al. (2012). The energy, E, of each sample is compared to the RMS (root-mean-square) energy in the window before that sample. Kurtosis Picker (Saragiotis, 2001). Kurtosis describes a probability distribution; a long-tailed distribution, with many outliers, has high kurtosis. The picker assumes that seismic noise amplitudes have a Gaussian distribution while an earthquake arrival does not. Each trigger has several parameters that need to be optimised jointly. This was done by trying many different combinations for each trigger and ranking them based on the number of known phases found, with some consideration to the number of false triggers. In the absence of any induced seismicity in the central part of the Vale of Pickering, we use data from a sequence of mining-induced earthquakes at Thoresby Colliery, New Ollerton (Verdon et al., 2017) to test the different detection algorithms. In February 2014, BGS installed a network of seven seismometers around the mine (Figure 30) after local residents felt a number of earthquakes. This resulted in the detection of over 300 earthquakes, which have been accurately located using a local velocity model (Bishop et al., 1994). We used 63 of these events, with a total of 362 manually picked P-wave arrival times on local stations. Figure 30 Location calculated for earthquakes at Thoresby Colliery. The red dots are the locations using the national network only. The yellow dots are the locations also using the local network shown by the green triangles. The black rectangles are coal seams at 1 km depth. © Crown Copyright and/or database right, 2018. Licence number 100021290 EUL. We tested each algorithm using only short windows of data around known events, rather than scanning long continuous records. This allowed us to check the accuracy of automatic picks by comparing them against manual picks, as well as to assess the number of missing and false detections. We consider a pick ‘good’ if it is within 1 second of the manual pick for that station. Picks made more than 1 second from a manual pick were considered ‘bad’. We also consider the time taken for the algorithm to scan the data for each. The results are summarised in Table 6. Table 6 Summary results of testing the different detection algorithms. Apart from the Z-detect algorithm, all of the pickers detected more than 80% of the picks found for these events manually. This means that, they would have detected all of the events if three station triggers were required for a detection. However, we find significant differences in the number of bad picks and in the time taken to calculate the characteristic function. The latter is an important consideration for real-time detection and location, and both the AIC picker and the Kurtosis pickers are unsuitable for real-time processing for this reason. The number of bad picks is important because too many bad station picks increase the chance of bad event triggers significantly. Both the basic STA/LTA and the Carltrig STA/LTA have many more bad picks and so are not optimal. This leaves the FBPicker as implemented by Lomax et al. (2012) and the recursive STA/LTA. The latter was quicker for this test and found slightly more good picks and slightly fewer bad ones. The difference is not significant but this algorithm is also very simple to implement and is the algorithm chosen to carry forward to the next step. We have begun to compile a library of waveform templates for known quarry blasts detected by the seismic sensor array. Further work will be carried on this dataset to discriminate events better from operational quarries and background seismicity. Recent research has shown that amplitude measurements from epicentral distances of less than 15–20 km considerably overestimate event magnitudes compared to more distant observations (Butcher et al, 2017). An example of this is that magnitudes calculated for earthquakes induced by hydraulic fracturing at Preese Hall, Lancashire (Clarke et al., 2014) using ground motions recorded on seismometers distances of a few kilometres away were unrealistically high. A detailed examination of the BGS earthquake catalogue shows that individual station magnitudes for stations within 5 km of an earthquake are up to an order of magnitude higher than magnitudes at other stations (Luckett et al, 2018, submitted). 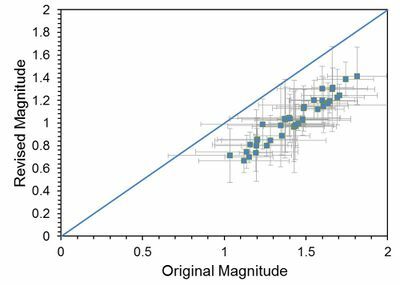 Luckett et al (2018) have also developed a new magnitude scale to correct the overestimation of magnitudes at smaller distances. This scale is designed so that magnitude estimates at greater distances will be the same as when using the previous scale. We have applied the revised magnitude scale to calculate magnitudes for all the blasts from the Newbridge quarry close to Pickering. Figure 31 shows the original magnitudes plotted against the revised magnitudes. This indicates a clear reduction in event magnitude when the corrected scale is applied. The magnitude change varies, but is over 0.5 magnitude units in some cases. There is also a small reduction in the variance of the magnitude estimates when using the revised scale, as demonstrated by the error bars in Figure 31. Figure 31 Local magnitudes for Newbridge Quarry events calculated with the Hutton and Boore (1987) scale and a revised scale to correct for overestimation of magnitude at short epicentral distances (Luckett et al, 2018). Error bars show standard deviation in individual station measurements. 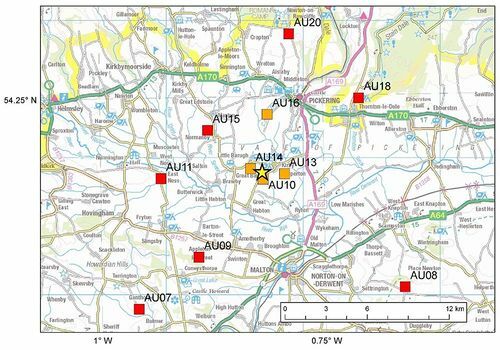 The networks of seismometers installed to monitor background seismicity in both the Vale of Pickering and the Fylde areas have operated successfully throughout the reporting period. Two additional stations were added to the Fylde network to improve detection and location capability. A further station is planned. All but one station show levels of data completeness over 90%. There was no significant change in recorded noise levels at any of the stations in the network. PDFs of the observed noise at each station have been used to estimate the detection capability of the Vale of Pickering network in low, median and high noise conditions. Although detection capability varies significantly, the network is capable of detecting events with magnitudes of 0.5 ML or less around Kirby Misperton. The monitoring networks have successfully detected a number of earthquakes around both the Vale of Pickering and the Fylde Peninsula. However, all of these are at some distance from the centres of interest. The Vale of Pickering network has also detected a number of other seismic events closer to the area of interest. The proximity of the calculated locations to quarries where blasting is known to take place, along with the recorded waveforms that are characteristic of a shallow source, suggest that all these events are quarry blasts. All the suspected blasts occurred during the daytime, which adds further evidence to an anthropogenic origin. The magnitudes of these events range from 0.7 ML to 1.6 ML. A number of phase-picking algorithms have been tested and have been found to give significant improvements in detection against our existing method. We have begun to compile a library of waveform templates for known quarry blasts that can be used to discriminate better between events from operational quarries and background seismicity. We have developed and applied a new magnitude scale to correct for overestimation of magnitudes at small epicentral distances. This results in a significant reduction of the magnitudes of quarry blasts in the Vale of Pickering by over 0.5 magnitude units in some cases. The variance in the magnitude estimates is also slightly reduced. This issue is critical for correct estimation of the magnitudes of any earthquakes induced by hydraulic fracturing. ↑ Ward, R S, Smedley, P L, Allen, G et al. 2017. Environmental Baseline Monitoring Project: Phase II — Final Report. Report of the British Geological Survey. OR/17/049. http://nora.nerc.ac.uk/id/eprint/517889/. ↑ Trnkoczy, A. 2012. Understanding and parameter setting of STA/LTA trigger algorithm, in New Manual of Seismological Observatory Practice 2 (NMSOP-2), IS 8.1, 20 pp. ↑ 3.0 3.1 Withers, M, Aster, R, Young, C, Beiriger, J, Harris, M, Moore, S, and Trujillo, J. 1998. A comparison of select trigger algorithms for automated global seismic phase and event detection. Bulletin of the Seismological Society of America, 88 (1), 95–106. ↑ Kitagawa, G, and Akaike, H. 1978. A procedure for the modelling of non-stationary time series. Ann. Inst. Stat. Math., 30, 351–363, Part B. ↑ Leonard, M, and Kennett, B L N. 1999. Multi-component autoregressive techniques for the analysis of seismograms, Physics of the Earth and Planetary Interiors, 113 (2), 247–264. ↑ Sleeman, R, and van Eck, T. 1999. Robust automatic P-phase picking: An on-line implementation in the analysis of broadband seismogram recordings. Physics of the Earth and Planetary Interiors, 113 (1), 265–275, doi: 10.1016/S0031-9201(99)00007-2. ↑ 7.0 7.1 Lomax, A, Satriano, C, and Vassallo, M. 2012. Automatic picker developments and optimization: FilterPicker: A robust, broadband picker for real-time seismic monitoring and earthquake early warning. Seismological Research Letters, 83 (3), 531–540. ↑ Saragiotis, C, Hadjileontiadis, L, and Panas, S M. 2002. Pai-s/k: A robust automatic seismic P phase arrival identification scheme. IEEE Transactions on Geoscience and Remote Sensing, 40(6), 1395–1404. ↑ Verdon, J P, Kendall, J M, Butcher, A, Luckett, R, and Baptie, B. 2017. Seismicity induced by longwall coal mining at the Thoresby Colliery, Nottinghamshire, UK, Geophysical Journal International, 212 (2). ↑ Bishop, I, Styles, P, and Allen, M. 1994. Mining Induced Seismicity in the Nottinghamshire Coalfield. Quarterly Journal of Engineering Geology, 26 (4), 253–279. ↑ Butcher, A, Luckett, R, Verdon, J P, Kendall, J M, Baptie, B, and Wookey, J. 2017. Local magnitude discrepancies for near-event receivers: implications for the UK. Traffic-Light Scheme. Bulletin of the Seismological Society of America, 107, 2, 532–541. ↑ Clarke, H, Eisner, L, Styles, P, and Turner, P. 2014. Felt seismicity associated with shale gas hydraulic fracturing: The first documented example in Europe. Geophysical Research Letters, 41, 23, 8308–8314. ↑ Luckett, R, Butcher, A, Baptie, B, and Ottemöller, L. 2018. Correcting Local Magnitudes at for Near-Event Distances. Submitted to Geophysical Journal International.